Engagement is a good thing. It’s been a metric for success and a driving force behind content marketing for years; organizations know the more engaged a customer becomes, the more likely they’ll be to purchase or recommend a product or service. Until recently, organizations looking to raise engagement haven’t had proven or measurable methods for doing so. Many use surface-level perks–think game rooms, free food, company trips, and casual dress codes–to attract candidates and make work more enjoyable. But recent studies and surveys suggest that engagement isn’t about perks. In fact, what most surveys show is that every stage of the employee experience, from the application process to the exit interview, impacts engagement. The takeaway? If organizations want to create, maintain, and benefit from strong employee engagement, they have to start at the beginning–before an employee’s first day–and follow through to the end. Clear. Accurately describing the company and the position helps prefilter unqualified candidates and speeds up candidate selection for recruiters and hiring managers. Consistent. Consistency improves how candidates perceive your organization. Scheduling responses and follow-ups to happen within a set timeframe also reduces disruptive communication delays in the hiring process. Caring. Even during hiring blitzes, there are real people on the other end. A personal touch gives new employees a positive first impression whether they’re applicant No. 5 or applicant No. 541, and it leaves those you don’t hire more open to applying again or leaving a positive review. HR must ensure onboarding provides the information and cultural exposure new hires need to feel confident on their first day. That means evaluating existing policy to ensure you’re not only checking off all the boxes but creating experiences that are memorable, timely, and reflective of your company values. It also means providing training to managers and following up with new hires down the road. Seek direct feedback. Listening to your employees helps you craft a benefits package that really meets their needs, not the organization’s perception of their needs. Educate early and often. Employees who fully understand their benefits not only get more value from their benefits, they also feel more cared for by their employer. Monitor benefit utilization. Knowing who’s using what can offer insights into the quality of your benefits package and the effectiveness of your benefits education. If your organization doesn’t make continual engagement efforts, it can be easy for stagnation to set in. 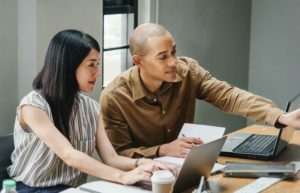 One way to maintain engagement is through career development–clearly communicating career paths at a department level and offering support throughout the organization for employees who want to broaden or improve their skill sets. That might involve financial aid for continuing education, free courses and instructional literature, mentoring and coaching programs, or all three. If your organization is flatter and lacks a clear path for advancement, providing alternative opportunities for growth are especially critical to keeping your people engaged; otherwise, employees may feel like they’ve entered a dead-end job. One of the most difficult challenges for employers is obtaining honest feedback from their own employees. Performance reviews and one-on-ones always have an air of evaluation, and even newer tools like pulse surveys and eNPS can’t guarantee 100% honesty. One opportunity, however, presents a high likelihood of gaining totally forthright information: exit interviews. While exit interviews can be emotionally charged, and that’s something to take into account, departing employees may also be inclined to reveal the things they’ve been hesitant to say while their jobs were in the balance. Developing a solid strategy for exit interviews that involves direct questions like, “What would you suggest to help us manage people better?” and, “Is there a benefit that would have influenced your decision to leave?” can give HR and executives incredible insight into what changes need to happen to keep people engaged and loyal. If there’s a top takeaway for HR, it’s that engagement is married to organizational culture. The way employees act toward each other, and how the organization acts as a whole, will crystalize whether or not anyone intends for it to happen–growing culture intentionally takes creating, communicating, and living a set of values that every person in the organization knows by heart and can look to for guidance. That’s why it’s so important that HR and upper management–the owners of culture–make a conscious effort to establish a cultural foundation around positive values from the beginning, before culture has a chance to grow on its own. And building a strong, positive culture doesn’t just make engagement initiatives easier–it is probably the best engagement initiative any organization can adopt.